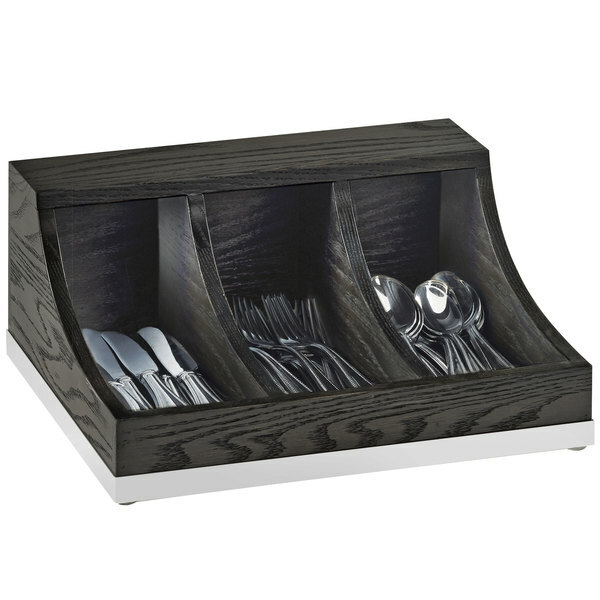 Keep your flatware or packaged condiments separated for easy identification and selection with this Cal-Mil 3802-87 Cinderwood 3 section flatware organizer! Coming with (3) 3 1/2" x 8" sections, this organizer allows you to provide guests with forks, knives, and spoons that are easily accessible. For added convenience, this organizer can also be used to hold stirrers, creamers, or sugar packets at your coffee station. The open, curved design notifies staff when refills are necessary, promising that your guests never run out of their necessary dining tools or favorite condiments. Constructed of Cinderwood stained oak wood with a mirrored base, this organizer provides a natural appearance that's great for vintage-themed venues and bed and breakfasts. Use it by itself, or add it to the rest of Cal-Mil's Cinderwood line (sold separately) to create a modern look to your buffet or catered event!